Moving household, parcels, perishables and small business consignments are always a challenge to families, SMEs and small time retailers. 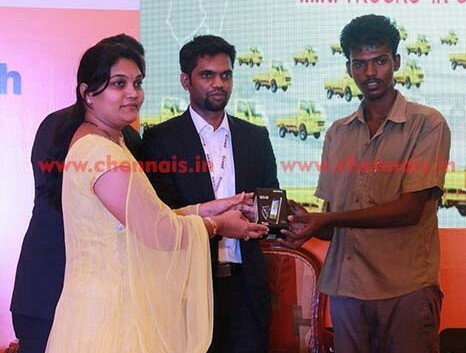 To bridge the gap and service this niche segment, two young men, Suresh Kumar and Ashwin Gurunathan have launched Cargoji, an online logistics firm in August 2015, in Chennai. One can log on to www.cargoji.com to move anything intra-city delivery ranging from household shifting, food delivery, business related deliveries etc. In four months from the launch, Cargoji.com has enrolled over 350 mini-trucks (TATA Ace, Dost, Eicher, TATA 407, etc) of different categories spanning entire Chennai. To enlarge the scope and get the public to understand this unique concept, a function was held where Mrs. B. Yamuna Devi, Additional Commissioner, Customs (Air CARGO) participated. It was an interesting sight to see more than 200 drivers being excited to receive smartphones from the dignitaries. Training to drivers about Cargoji Mobile App usage, manage their daily earnings and providing road safety regulations through the App. Engaging with Insurance providers and providing cost efficient insurance options to the Drivers. Cargoji creates logistics ease-of-access and economic solutions to businesses and Mini-Truck Drivers alike. Since enrolling with Cargoji, many truck drivers have reported a significant rise in business hours utilization and additional revenue. Business Customers have given positive feedback of standardized process and zero-negotiations with timely delivery.